When enjoying a superyacht charter around Greece and its beautiful islands make sure you spend some time on land to enjoy some of the best waterfront restaurants. Whitewashed walls perfectly contrasts with the deep blues of the cloudless sky and iconic church domes — around every corner lies a picture-perfect postcard moment. However, Santoríni isn’t just a feast for the eyes, your stomach will also find this Greek island particularly pleasing. Located at one of the most luxurious hotels on the island, Grace, the Santoro restaurant benefits from a jaw-dropping view over Skaros Rock and the submerged caldera’s sea. Opt for a table on the level below the inviting infinity pool and you’ll be blessed with front row seats for the famous Santoríni sunset. If the superb a la carte menu leaves you feeling indecisive, then you have no choice but to opt for the tasting menu. Designed to take you on a culinary experience that combines tradition with contemporary flavours, it is exactly what you’d want to eat in this breathtaking waterside setting. The seabass ceviche is an explosion of flavours — the fresh taste of the sea mixed with zingy citrus fruits and the earthy sweetness of marinated artichoke is a winning combination. While surf ‘n’ turf isn’t typically associated with high-end restaurants, we wholeheartedly recommend the pan seared octopus with fillet steak. The octopus was fresh and tender with a subtle smokiness and the steak melted in the mouth, complementing each other perfectly. In fact, every dish on the tasting menu is cooked to absolute perfection under the watching eye of Chef Spyros Agious. The tasting menu can be wine paired for an additional cost or, alternatively, you can’t go far wrong by washing it down with a bottle of crisp Assyrtiko from one of the many local vineyards, a favourite being Gaia Estate. For those exploring Northern Greece, the Ergon Deli is just one reason to visit Halkidiki this summer. 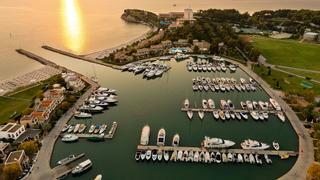 It's located at the heart of the Sani Marina, which is surrounded by the luxurious Sani Resort, nestled in lush green woodland and deep blue wetlands. 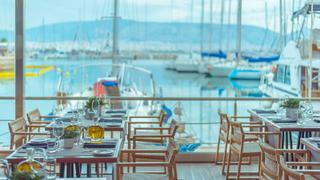 The majority of the tables at the Ergon Deli are located outside with views of the various yachts moored in the marina —which can host yachts up to 33 metres — and a turquoise sea beyond. Aside from being the perfect spot to catch the radiant pink sunset, Ergon Deli serves up some of the most delicious meze plates in Greece. To avoid food envy, it's best to share. Opt for an aromatic dish of Ntolmadakia, vine leaves stuffed with rice and herbs to be generously dipped in mint yoghurt. While slow cooked lamb shank with eggplant puree, tahini and smoked pepper is also ludicrously flavoursome, the turophile should select the Gruyere from Naxos. Though your waistline won't thank you, your taste buds will revel. It would be a crime not to save space for the Greek coffee cheesecake — smooth, sweet and indulgent, it has just the right amount of kick in order to see you through several nightcaps from Ergon Deli's extensive wine list. The Amanzoe Resort Beach Club is an oasis overlooking the Aegean's twinkling blue waves and offers guests a choice of four pools, overnight Cabanas, a gym and a spa. Serene and laid back, this is the perfect spot for a bite to eat with fantastic sea views after a morning of diving and snorkelling. Set just a short distance from the luxurious hilltop resort, the Amanzoe Beach Club has a sleek, contemporary feel without sacrificing classic Grecian undertones. 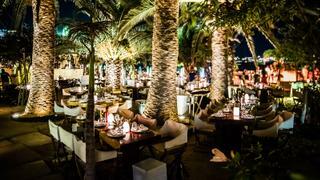 Outdoor tables sit atop the soft golden sand and are shaded by lush indigenous trees. Enjoy a cocktail at the open-sided beach bar before heading to your table to treat yourself to an array of culinary delights. Tuck into an indulgent lunch of sea urchin with Bottarga crostini, local seaweed and lemon caviar followed by a classic calamari dish or the succulent grilled tiger shrimp, with a plate of zucchini patties with mint, feta and yoghurt to share. Keep it simple with dessert and opt for the homemade fruit sorbets in a myriad of intense flavours, which are well worth saving some space for. 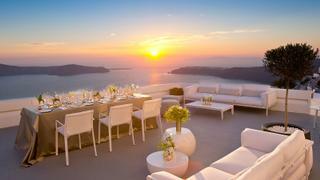 Additionally, guests can enjoy a Greek style beach barbeque twice a week. Known for a rich maritime history, the Mikrolimano harbour is worth visiting as a day trip away from the hustle and bustle of Athens. While surrounding Piraeus is a little on the industrial side, the harbour is a pretty bay that comes alive after dark, with soft lights trailing into the hills overlooking the sea. The Michelin-starred Varoulko Seaside sits in the stunning Mikrolimano harbour, just a short drive away from Athens. With views of boats bobbing and swaying gently in the marina and out to sea, it's an idyllic spot to enjoy some seafood. For lunch, share a few starter dishes such as breaded smoked eel, grilled octopus from Kalymnos, steamed clams in Limnio wine and grilled cuttlefish with caramelised lentils and orange sauce. If you fancy going solo on the main course, then the steamed monkfish is a dish you'll regret missing out on. Alternatively, try world-renowned local chef Lefteris Lazarou's special for something that's definitely more off the beaten track. The dinner menu offers an array of lavish seasonal seafood places — again, chef knows best when it comes to the fish-based main courses, but for a hit of intense flavour and spice opt for the orzo cooked with crayfish, Parmesan and Boukovo. As one of the best restaurants in the Mediterranean, this is one not to miss. This luxury hot spot is located on the lively Psarou Beach on Mykonos and has hosted a number of famous faces, such as Liz Hurley, Hugh Jackman, Mariah Carey and Lionardo Di Caprio. Aside from soft white sand and turquoise water, Nammos boasts it's own high-end boutique, shisha bar, beach bar, a number of Riva yachts and four private cabanas, each complete with Jacuzzi, mini-bar and butler. The restaurant has an eclectic range of offerings, from sushi rolls and sashimi to sandwiches and steak frites. An ever-changing Mediterranean menu focused around the freshest ingredients available, if you spot the Greek-style orzo with veal cheeks on the menu make sure you order a plate of this sumptuous offering. Famed for its parties, Champagne menu and sublime celeb-spotting, Nammos is the place to go for enjoying a beachfront celebration in the height of luxury.